Eleven-year-old Owen, from Dubbo, has been visiting Sydney Children’s Hospital, Randwick since he was three years old after he couldn’t shake what appeared to be a bout of Gastro, and he became puffy and swollen. Some routine tests revealed he had Nephrotic Syndrome. Nephrotic Syndrome causes loss of protein from the kidneys and has severe effects on the body, including high cholesterol and fluid collecting around the heart and lungs. When the family arrived at Sydney Children's Hospital, Randwick, Natalie and Anthony (Owen's parents) asked their medical team as many questions as possible and tried to find out as much as they could about Owen’s condition. They even underwent genetic testing on both sides of the family. Natalie and Owen slowly got into a routine of travelling to and from Dubbo, and our Hospital soon became like a second home. Over the years, Owen has been through so much. He’s had more than 15 operations, including having his left kidney completely removed to try and stop the protein leaking. He’s also had to cope with the serious side effects of his condition. 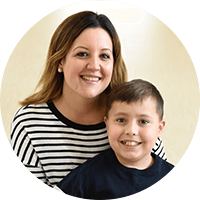 At age 6, he stopped growing, so he saw the Endocrine team at our Hospital and they prescribed growth hormones. When they were at home again, Natalie had to give Owen his injections six times a week. "The Hospital is such a special place – and it’s like our second home now. All the nurses know us by name. Everyone makes sure we are ok and they try really hard to make sure the kids have chance to play and do things that take their minds off being sick." It’s been really tough on Owen's family but they still get on and do what they need to do. While Owen has had a lot to endure he still has special moments and loves all of the activities and outdoor places at the Hospital which have helped to take his mind off the painful procedures and operations. Last year, the family had another devastating setback. Owen’s remaining kidney was shutting down and he was in renal failure. He needed a life saving transplant but thankfully his dad, Anthony, was a match. After ten long weeks of dialysis, the day of the transplant arrived. Owen came out of theatre around 6pm but had to be rushed back in again when he started bleeding. He was kept in Intensive Care for a week as there were some post-operative complications with his blood pressure, but three months on Owen (and Anthony) are doing well. Even though Owen will have to keep taking medication daily for his whole life, his future is looking bright and he can’t wait to settle back into school in Dubbo. Make every moment count for sick kids.